Science Fiction is a fun genre. It manages to be slightly more respectable than fantasy simply by substituting science for magic. Best of all, though, it is easy as pie to write. Mostly you can just make things up, but if you ever get stuck, referring to a handful of simple rules will get you back on track. The first thing you need to do if you are trying to write a believable futuristic setting is to massively increase the number of buttons. More buttons equals more power. Every action with every piece of technology will require no less than three buttons and two switches. Starting your car? Hope you aren’t in a hurry, because it is going to involve two control panels, at least one overhead. Of course, how are you going to know if all of that tapping away at keypads is getting you any closer to setting your toaster to dark? Lights! Lights, scattered irregularly and blinking in arbitrary patterns, are the future of consumer notification. They provide excellent feedback, they keep toddlers and cats fascinated, and they are technology in its most fundamental form. The age of science started when the light bulb was invented. Simple arithmetic states that more lights equals more advanced devices. It is important that nothing be mundane in your Sci Fi world. Everything must be epic, futuristic, or mysterious. Tacking on high tech buzzwords can get tricky, though, when you hit something that isn’t technology. A hole in the ground, for example. You couldn’t very well call something like that a cyber-hole, could you? … Well, not unless it was in your head. Luckily there exists an all-purpose word you can apply to any natural phenomenon to make it suitably science fiction-y. Temporal. Temporal means of or relating to time, and since the future is just the present plus time, adding more time to the plot makes it futuristic by definition. 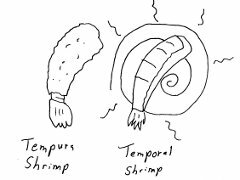 Plus, as an added benefit, temporal sounds suspiciously like it has something to do with a delicious batter-dipped deep-fried Japanese delicacy. So that’s not a hole, it is a temporal pit! That’s not a storm, it’s a temporal maelstrom. As a matter of fact, if ever you need a big scary thing to drive your plot forward, just pick one or more of the terms from the following list, and slap temporal on it: Vortex, Paradox, Void, Wavefront, Cascade, Anomaly, Nexus. The last fifteen years of Star Trek Film plots are buried in that list. Rarely, just choosing the appropriate negative space wedgie and flying toward it with the aid of a space ship that looks like a truckload of keyboards collided with a truckload of Christmas trees isn’t enough to make a good Sci Fi story. In those cases, all you need to do is take a pre-existing tale and move it to space. The Bible is popular for this, as George Lucas can no doubt tell you, but there are plenty of other options. Shakespeare, Greek tragedies, even Pinocchio can benefit from a little interstellar style shifting. Before you know it, cyborg-Oedipus will be destroying his own occular implants after killing his designer and marrying his manufacturer on one of Jupiter’s moons. Now you know just a few of the many secrets that will help you craft a pitch perfect Sci Fi classic. Whether you are in it for the camp or one of those who insists it be called “Speculative Fiction,” applying a cascading temporal wavefront paradox and tossing in a little Midsummer Night’s Dream will help you churn out a story in no time. Naturally this is only scratching the surface, so if you have any rules of titanium reinforced nano-tech thumb, let us know, and we’ll gather them up for a second pass. Until then, Earthlings.